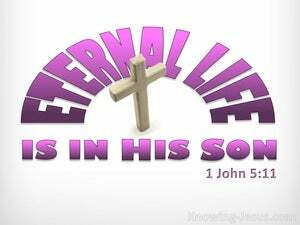 ﻿ 1 John 5:11 And the testimony is this, that God has given us eternal life, and this life is in His Son. 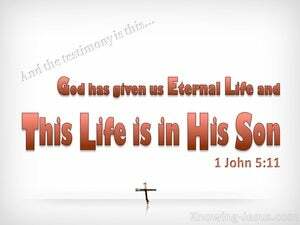 And the testimony is this, that God has given us eternal life, and this life is in His Son. This is the testimony: God has given us eternal life, and this life is found in his Son. And this is the testimony, that God gave eternal life to us, and this life is in his Son. And this is that testimony (that evidence): God gave us eternal life, and this life is in His Son. And this is the testimony [of God]: He gave to us [the hope of] never ending life, and this life is [available through fellowship] in His Son. And this is the testimony, that God has given us eternal life: and this life is in his Son. And his witness is this, that God has given us eternal life, and this life is in his Son. Now what is testified, is this, that God has given to us eternal life: and this life is by his son. Now this is the testimony, that God has given to us eternal life: and this life is in his Son. And this is the testimony, that God has given unto us eternal life, and this life is in his Son. And that testimony is that God has given us eternal life, and that this life is found in his Son. And this is the testimony, that God hath given us eternal life, and this life is in his Son. And this is the witness, that God has given eternal life to us, and this life is in his Son. And this is the testimony, that God has given us eternal life, and this life is in his Son. And this is the witness, that God has given to us eternal life, and this life is in his Son. And this is the record, that God has given to us everlasting life, and this life is in His Son. And this is the witness: how that God hath given unto us eternal life, and this life is in his son. And the testimony is, that God gave us life eternal and this life is in his Son. And the testimony is this, "God has given us eternal life, and this life is in his Son." And this is the witness, that God gave to us everlasting life, and this life is in his Son. And this is the testimony, that God hath given life eternal to us; and this life is in his Son. And that testimony is that God gave us Immortal Life, and that this Life is in his Son. And this is the testimony, that God hath given to us eternal life: and this life is in his Son. And that testimony is to the effect that God has given us the Life of the Ages, and that this Life is in His Son. And this testimony is that God has given us eternal life, and this life is given through union with His Son. And this is the testimony, that God gave to us eternal life, and this life is in His Son. And the testimony is this, that God hath given to us eternal life; and this life is in his Son. 10 The one who believes in the Son of God has the testimony in himself; the one who does not believe God has made Him a liar, because he has not believed in the testimony that God has given concerning His Son. 11 And the testimony is this, that God has given us eternal life, and this life is in His Son. 12 He who has the Son has the life; he who does not have the Son of God does not have the life. "I know that His commandment is eternal life; therefore the things I speak, I speak just as the Father has told Me." keep yourselves in the love of God, waiting anxiously for the mercy of our Lord Jesus Christ to eternal life.